Elizabeth Rhodes Holloway's career has taken her far from her roots on Kenmore Plantation in Pointe Coupee Parish near Maringouin, Louisiana. An M.F.A. graduate of the Yale School of Drama in design and production with a B.A. in acting from Newcomb College, Holloway has travelled the U.S., extensively working in theatre, opera, and ballet. 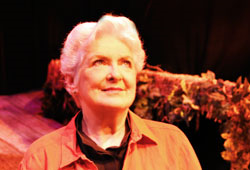 Holloway is one of the founding members of the Missouri Repertory Theatre (now known as the Kansas City Repertory Theatre) at the University of Missouri-Kansas City (UMKC), where she served as the first professional production stage manager. Under Holloway's professorial leadership and virtuosity, the first stage management course in the country was developed at UMKC. Her lifetime achievements include work at many of the great artistic venues in the world, including The Festival of Two Worlds in Italy, The Center Theatre Group in Los Angeles, American Ballet Theatre in New York, American National Opera, Lyric Opera of Chicago, the New York Shakespeare Festival, the Metropolitan Opera, and Broadway. She has collaborated with creative intellects that include Joseph Papp, John Houseman, Tony-award winning designer Oliver Smith, James Earl Jones, Edward Albee, Estelle Parsons, Rudolf Nureyev, and Franco Zeffirelli, to whom she was a special assistant for lighting for the opening of the new Met. Although Holloway maintains residences in Manhattan and France, she has never forgotten her home state and has settled down in Baton Rouge, where she has served for many years as a prominent member of the Swine Palace Board of Directors. Reflecting on her professional career of forty years in the performing arts, as well as her deep-rooted love for theatre and opera, Holloway has generously endowed M.F.A. scholarships for Department of Theatre students. "We theatre people are interpreters—of the playwright, the composer. 'Live theatre' is a moment in time, unique, ephemeral, exacting, then gone—each performance different, distinct. LSU Theatre's program is taking a noteworthy place among universities with professional Equity theatre companies. Establishing these M.F.A. scholarships will give more of our young people their 'moments,' lengthening for them—and ultimately for us—that brief, yet so special, experience that is captivating live theatre," notes Holloway on the significance of her gift to LSU Theatre. "This is 'giving back'—to my parents, James Madison and Elizabeth Mandell Holloway, and to my home state." Since her return to Baton Rouge, Holloway has established yet another career for herself as a professional beekeeper. She raises bees, produces honey which goes to some of Louisiana's finest dining establishments, makes beeswax candles, and has developed a caramelized honey which has the Food Network buzzing. To join Elizabeth Holloway in supporting the performing arts at the LSU College of Music & Dramatic Arts through a named gift or donation, please contact Julie Bolton Falgout, PhD, at 225-578-5846 or jfalgout@lsufoundation.org.